This page summarises the local government organisation of Kent since 1889. Kent County Council was formed in 1889, and in 1894 a network of boroughs, urban district and rural district councils was formed across the county. Kent had eleven Municipal Boroughs dating from 1836 (or before): Canterbury, Deal, Dover, Faversham, Folkestone, Gravesend, Hythe, Maidstone, Rochester, Sandwich and Tenterden. Canterbury became a County Borough in 1889 and so was effectively independent of Kent County Council. Several new boroughs were created after 1836: Margate (1857), Ramsgate (1884), Lydd (1885), New Romney (1885), Queenborough (1885), Tunbridge Wells (1889), Chatham (1890), Bromley (1903), Gillingham (1903), Dartford (1933), Beckenham (1935), Bexley (1937), and Erith (1938). Penge failed in its attempt to become a borough in 1934. 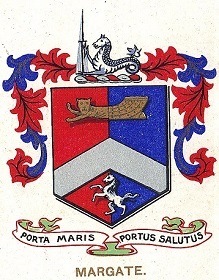 Though Queenborough became a borough in 1885, its bankruptcy meant it was unable to appoint a borough council until 1937. Tunbridge Wells became Royal Tunbridge Wells in 1909. Queenborough was enlarged and became Queenborough-in-Sheppey Municipal Borough in 1968. Canterbury and Rochester were Cities of long standing. From 1894 there were also 20 Urban Districts: Ashford, Beckenham*, Bexley*, Broadstairs & St Peter's, Bromley*, Dartford*, Erith*, Gillingham*, Herne Bay, Northfleet, Milton next Sittingbourne (renamed Milton Regis in 1907), Sandgate, Sevenoaks, Sheerness, Sittingbourne, Southborough, Tonbridge, Walmer, and Wrotham UDCs. Those marked * later became Municipal Boroughs as listed above. Urban Districts had similar powers to boroughs but lacked the powers to appoint mayors or aldermen. Some new urban districts were later formed for: Cheriton (1898), Penge (1899), Chislehurst (1900), Foots Cray (1902, renamed Sidcup 1921), Crayford (1920), Swanscombe (1926), and Orpington UDC (1934). In 1930 Milton Regis and Sittingbourne were merged as Sittingbourne & Milton UDC. There was some reorganisation in 1934. Cheriton, Sandgate and Wrotham UDCs were abolished and merged into adjacent council areas. Chislehurst and Sidcup were merged as Chislehurst & Sidcup UDC. In 1935 Walmer UDC was abolished and merged into adjacent districts. In 1968 Sheerness UDC was abolished and absorbed by Queenborough-in-Sheppey Muncipal Borough. There were also 24 Rural District Councils covering the areas outside the major towns. These were: Blean, Bridge, Bromley, Cranbrook, Dartford, Dover, East Ashford, Eastry, Elham, Faversham, Hollingbourne, Hoo, Isle of Thanet, Maidstone, Malling, Medway, Milton, Romney Marsh, Sevenoaks, Sheppey, Strood, Tenterden, Tonbridge, and West Ashford RDCs. Most Rural Districts were initially based on the Poor Law Unions, with meetings held at the workhouse. In 1905 Medway RDC was absorbed by Malling RDC. In 1934 there was a reorganisation. Blean and Bridge RDCs were merged as Bridge-Blean RDC; Bromley and Faversham RDCs were abolished and absorbed by adjacent districts. In 1935 Hoo and Isle of Thanet RDCs were abolished and absorbed by adjacent districts. Milton RDC was abolished and replaced by a new Swale RDC. In 1968 Sheppey RDC was abolished and absorbed by Queenborough-in-Sheppey Municipal Borough. In 1965 the Bexley and Bromley areas were transferred to Greater London. The London Borough of Bexley was formed from the merger of Bexley and Erith Municipal Boroughs, Crayford UDC, and part of Chislehurst & Sidcup UDC. The London Borough of Bromley was formed from the merger of Beckenham and Bromley Munciipal Boroughs, Orpington UDC, Penge UDC, and part of Chislehurst & Sidcup UDC. The village of Knockholt was later transferred back to Kent. In 1974 major reorganisation saw the urban and rural districts abolished and a 2-tier structure established, with the County Council and fourteen districts: Ashford, City of Canterbury, Dartford, Dover, Gillingham, Gravesham, Maidstone, Medway, Sevenoaks, Shepway, Swale, Thanet, Tonbridge & Malling, Tunbridge Wells. The county town is Maidstone. In 1998 Gillingham and City of Rochester-on-Medway, together with some adjacent areas, amalgamated to form an enlarged Medway Council, a unitary authority. As a result, Rochester lost its city status. Medway remains in Kent for ceremonial purposes.